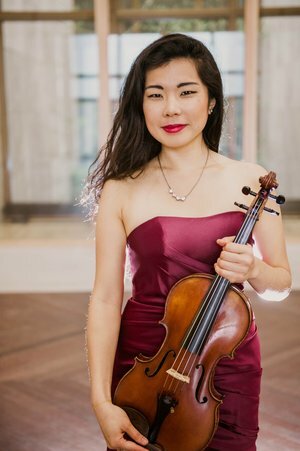 Hailed for her “magnetic, wide-ranging tone” and her “rock-solid technique” (Philadelphia Inquirer), violist Ayane Kozasa enjoys a career that spans a broad spectrum of musical personas. A violinist turned violist, Ayane holds a Bachelor of Music from the Cleveland Institute of Music and artist certificates from the Curtis Institute of Music as well as the Kronberg Academy Masters school in Germany. Ayane’s solo career took off when she won the 2011 Primrose International Viola Competition. Following the competition, she joined the Astral Artists roster and became a grant recipient from the S&R Foundation, an organization recognizing and supporting young aspiring artists of all mediums. Her international solo opportunities have been a platform to unearth seldom-heard works and to commission new pieces, an aspect of viola playing that she loves. Most recently, Ayane commissioned a work by Brooklyn composer Paul Wiancko for viola and cello, which they premiered in Washington, DC, at the S&R Foundation. Chamber music has also been a vital part of Ayane’s musical career, and her interests have led her to appearances at numerous festivals, including the Marlboro Music Festival, the Kingston Music Festival, and the Ravinia Festival. She is a founding member of the Aizuri Quartet, the current quartet-in-residence at the Curtis Institute of Music and the winner of the 2015 London Wigmore Hall International String Quartet Competition. Ayane is also the principal violist of the Chamber Orchestra of Philadelphia, a position that she has held since fall 2012. Ayane is deeply grateful for the mentorship she received from her past teachers, Nobuko Imai, Kirsten Docter, Roberto Diaz, Misha Amory, and William Preucil.